Yalex is a single braid, 12-strand rope constructed of Performance Fiber’s type 1W81 high-tenacity polyester (the same polyester used in Double Esterlon). Yalex is finished with a Maxijacket coating to optimize the abrasion life of the rope. 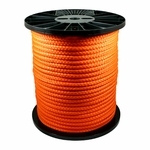 It's the strongest polyester rope we offer and is very easy to splice. It also features a two-end-per-carrier construction which creates a large void in the middle of the rope, making it easy to splice even after use and very convenient for sling production. The smaller sizes 3/8" - 1/2" are coated orange, while 5/8" is yellow and 3/4" is blue. Other colors available upon request (requires a special order with the factory).